Once a year, the Historical Society has a pot-luck “dinner on the grounds,” just as our forebears did. At the same time, we come together to elect our public servants, as did our grandparents and great-grandparents. Annual Meeting on Saturday May 12 at 11am. Bring a dish to share (about 12 servings) and your questions for our proposed Slate of Officers and Directors*. If you would like to nominate from the floor other members to serve, you may do so at the meeting. whose passing on May 4 2012 we mourn. Please join us in offering comfort and fond memories of Pete with his wife Diane and their family. If you would like to make a donation in Pete’s memory at this get-together, please see Linda Garcia, Site Manager, or any of the other Directors. We will also be asking all members their preferences for volunteer tasks for the 2012-2013 season, and collecting email addresses so that we may utilize full-color email options for our Society newsletter, thus saving the membership tedious volunteer work and desperately-needed-elsewhere dollars. 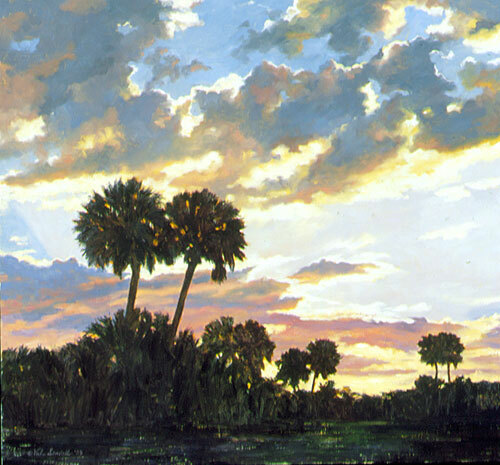 We have borrowed the beautiful Florida sunset painting from Val Sandell, whose other works may be viewed at http://valartist.com/works. 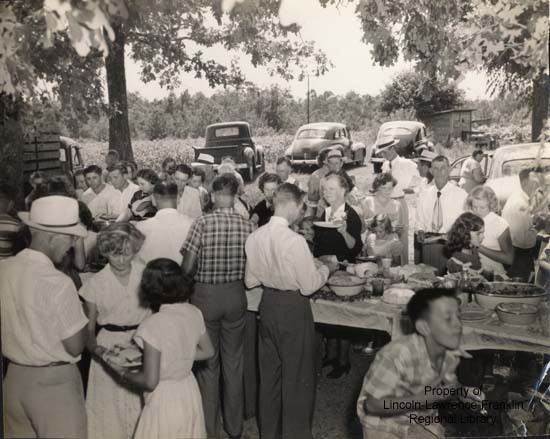 The vintage “dinner on the grounds” photograph is from Mississippi, and I’m betting some of our members will be able to date it for me from the automobile models!